How Does Google's Predictive Traffic Maps Work? Home > Google News > Misc Google > How Does Google's Predictive Traffic Maps Work? We know how Google Maps plots much of the real time traffic. In short, they watch people via their mobile phones and see how fast they are driving in real time. But how do they go about the predictive traffic? 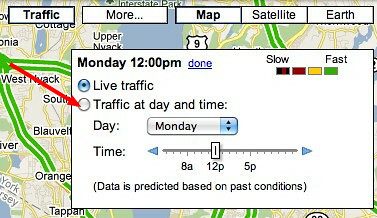 If you click on the "Traffic" button and then select "change" from the real time and select the "traffic at time and day" you will be able to have Google predict traffic conditions on a certain day and time. Yes you are correct it is not an attempt to predict travel time under "current" traffic conditions. It is simply a measure of how quickly (slowly) traffic is moving along those roads at times when it tends to move its slowest. There is no specified time interval. It's not like we say "rush hour tends to be at 5:00, so let's measure the speed of traffic at 5:00 every day for a month and say that's the time in traffic". That obviously wouldn't work, because rush hour times are a little different everywhere. Think of it more as if we said, "when traffic was its worst today, how slowly was it moving" and answered that question every day for a month. By coincidence, the time when that happened would tend to be rush hour, but that time could be different depending on the city, road, and direction of traffic. It's more sophisticated than that, because as I said we don't want to include extraordinary events such as accidents, but that gets the general idea. The point is, that time is intended to be the worst case driving time barring extraordinary events. So what I understand, Google pulls out outlier data caused by accidents or other issues and does some basic statistics to formulate a good prediction based on the live traffic data they collect on a daily basis. Hi, this is the same Dave that answered the question in the help forum. I want to clarify that question concerned our "time in traffic" prediction associated with some driving directions results*. It didn't (at least as I understood it) have anything to do with the "traffic at day and time" layer that you reference in your post. *For example, if you get directions from Seattle to Portland (http://maps.google.com/maps?f=q&saddr=seattle&daddr=portland) the first suggested route will give estimated driving time under typical conditions and estimated time "in traffic". The "in traffic" time is what the poster to our forums was asking about.